The Mixxx team is proud to announce the final release of Mixxx 1.7.0! The result of countless contributions from developers all over the globe, Mixxx 1.7.0 features an overhauled MIDI mapping system with advanced scripting capabilities, improvements to vinyl control, and many other tweaks and optimizations. Our brand new MIDI scripting engine allows both users and developers to easily add complex behaviour to their MIDI devices. Whether you're looking to get more out of your existing controller or want to take full advantage of cutting edge hardware, our 1.7.0 release won't disappoint you. If you'd like more information on MIDI scripting, please see our documentation. 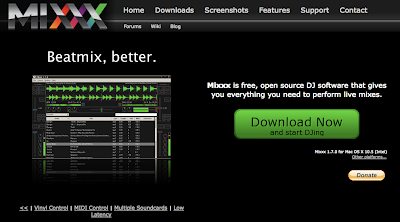 Mixxx 1.7.0 is now available on our downloads page. MIDI output now fully supported on Windows, OS X, and Linux. Added full support for the Stanton SCS.3d and SCS.1m on all platforms. Added Mixman DM2 mappings for Linux and OS X.
Scratching responsiveness improved, with needle-skip prevention option added. Signal quality indicators added to vinyl control preferences. The default skin is now widescreen, and fits nicely on netbook sized screens. Stereo master VU meter added. Cue points are now saved in the library for each track, with "auto-recall" cue option added to preferences. Support for more platforms: 64-Bit Windows and a Universal OS X package for 10.4+! Over 100 bug fixes and more! With the release of 1.7.0, we've also transitioned to a more flexible development process. Because of this increased flexibility, we're already hard at work on Mixxx 1.8.0, which will feature looping and an overhauled library. With the release of 1.7.0, we're now able to spend less time incorporating support for new MIDI controllers, and more time working on the features you want the most. Mixxx's development has always been driven by constant feedback from our users. Whether you're coming up with cool ideas on our forums or even just reporting bugs, we always appreciate hearing from you. Because your feedback is so valuable, we've launched a user survey to help us figure out where you want Mixxx to go. Taking a few minutes to fill out the survey is a easy way to help out the project and will help guide our future work. Lastly, we're always looking for new contributors, and we hope our recent move to Launchpad and Bazaar for source code management will add more transparency to our development and encourage more people to get involved. If you're a programmer and want to work with a creative, enthusiastic team, hop on our IRC channel (#mixxx on Freenode) or sign up for our developers' mailing list. Mixxx has always been driven by constant feedback from our community of DJs. 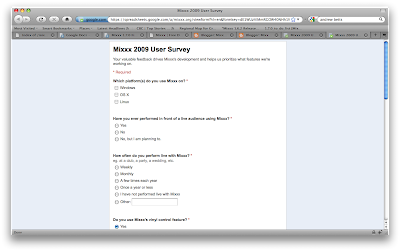 Two years ago, you helped steer the development of Mixxx by giving us feedback through a user survey that we created. Consequently, we focused our efforts for the last two releases on the features you asked for the most, and it's time to get another round of feedback to find out how we've done, and where you'd like to see Mixxx go. So if you have a few minutes, please fill out the Mixxx 2009 User Survey! We read every response and appreciate your feedback. Filling out the survey is a fast and easy way to make a contribution to Mixxx, and your responses will make a big impact on future releases. Thanks! A DJ tears it up with Mixxx and the SCS.3d.